Another find in the basement stacks. 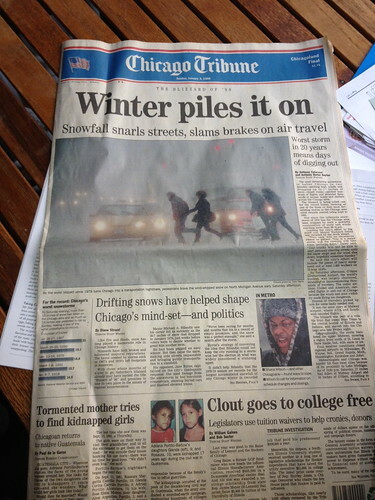 I vaguely remember this storm. We were supposed to go to an Iowa Hawkeyes-Northwest Wildcats basketball game the Saturday the storm arrived. After some brief discussion, we decided that was not a good thing to do so we stayed home. When we awoke the next morning, we had 2 feet of snow, more in the driveway because of the small hill and the drifting. The snow had ended overnight and the clouds broke to reveal one of those impossibly gorgeous blue skies that are so common in the winter. What I remember most is the digging out and not for a positive reason. We didn't own a snowblower so we had to shovel. At the time, there were three of us living here. We did a two hours on, 2 hours off rotation. Carole was a sophomore in high school so she could shovel. By noon, a neighbor came by and blew out the drive. We shoveled the driveway apron and had shoveled the walks, the front steps and the deck. We started in liberating the cars. That afternoon, the Green Bay Packers were playing the San Francisco 49ers for the National League title. My ex was a big Packer fan. There was a game before this one, so the Packers-49ers was not slated to start until 3:30 our time. We got the ex's car freed and he backed it out of the drive to make sure he could leave in the morning. Carole and I started working on freeing my car. My ex came back from a drive around the block and dashed inside. I went in and said, "My car needs about 45 minutes worth of work. If you come help, we can get it done faster." He looked at me and said, "Absolutely not. The Packers are going to be playing football. That was the deal. I'll shovel until the game and then I don't have to shovel any more." I just stood there looking at him. First of all, there had been no such deal. We were going to dig ourselves out. The only thing that could have waited was the sidewalks, but getting to the drive was easier if we shoveled those out, so that's what we did first. Secondly, the other game was still, at this point, 10 minutes from completion and if you know anything about pro sports, 10 minutes left in a game means it will take 30-40 minutes to play, what with all the time outs and TV breaks. He went into the bathroom, took off all his winter gear, left it in a pile and plopped down in front of the TV. His car was free and that's all that mattered. Carole and I spent the next hour digging out my car and widening the front walk. When we came inside, the first game was still going and he had made no effort, during commercials, to take care of his winter clothing. It was still in a soggy pile in the bathroom. I knew, at that point, that unless there were major changes in attitudes, I did not want to be married to this person anymore. He would not have missed any of "his" game and we would have been done much sooner if he'd helped. That idea wasn't remotely in his mind. All of these memories flooded back when I looked at this newspaper. Since 1999, I've endured 3 more blizzards. I've faced them on my own. It can be tough, but there is a great deal of satisfaction in handling winter by myself. I tossed this paper in the recycling bin. There are some milestones you want to remember and some which are better off being pitched.